The Pro Performance Video Channel features both live sound AND video. This channel showcases your live performance, so the higher quality the sound and lighting, the better. Be sure to take into account where you're standing on stage as well as where the video is shot from to ensure the best vantage point for your performance. The Pro aspect of this channel is a key component we want you to show us that you can really put on a show! We're not looking for artists that stand on the stage like statues, but instead show some life and animation. Another measure of just how great of a show you're putting on is the audience; show us your audience is into the show by getting them involved! In addition to yours and the crowd's excitement levels your band has to sound good. That means your singer has to hit his notes, your drummer has to set the time right, your guitarist has to nail the solos, etc. Cover songs are not allowed in any of the Video Channels. Promotional videos designed to market a product such as a CD, movie, etc., are not appropriate for the Video Channels, and violate our terms and conditions. All other genres are accepted to this channel. 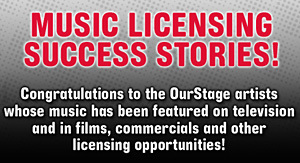 To learn more about the Pro Performance Video Channel or have additional questions visit the OurStage FAQs for more details.